Stay up to date with Web Cube happenings and everything at the forefront of digital. As the holiday season comes to an end we’ve tracked the shopping trends that started as early as the weekend of Thanksgiving, or Cyber Weekend as it has been dubbed. Aware of the shorter shopping season giving retailers 6 days less than last year, stores made sure they ramped up the deals to attract more traffic. Despite the blow out sales and optimistic outlook, shoppers were not motivated enough to take a trip to the store as mobile and tablet sales trumped in-store sales. Not only are shoppers avoiding the mall but they are turning to their smart phones and tablets that are easily accessible to them 24/7. According to early reports from IBM, 25% of online traffic comes from smartphones and 15.2% comes from tablets but when it comes to sales, 15.7% of customers chose their tablets to shop compared to 7.4% who used their smartphones. Tablets also averaged 13% more dollars spent per order than smartphone purchases. Retailers are taking note of this shift in purchasing preferences and are trying to adapt as quickly as possible. Gap introduced the “Reserve in Store” option that allows you to find the item online and keep it on hold at a store close to you, Kohl’s offers “Ship from Store”, and Amazon and Ebay advertise same day delivery. With the goal of maintaining online sales while also bringing customers inside stores, now more than ever brands are prioritizing building robust online stores with powerful eCommerce platforms to optimize sales in every channel. As eCommerce becomes the prominent channel for consumers purchasing gifts during the holidays, it is essential for brands to equip their online stores with the right features and promotions to maximize sales and gain customers. The holiday season is the perfect time to grow online sales with good customer service, product campaigns, and promotional discounts. In order to have a successful holiday shopping season, sites must accommodate consumer needs and provide them with the best online shopping experience possible. Here are five tips from the Web Cube team on preparing your eCommerce site and digital marketing for the upcoming holiday season! During the holiday season, consumers are looking for the best deals on items they wish to purchase. Providing holiday discount promotions will not only drive traffic to your site, but also increase overall online revenue. Brands should also consider additional promotions including free shipping, coupons or customer loyalty programs. These offers can be used to attract and retain new customers as well as generate additional revenue. Decide your promotion strategy early on so you can begin planning your holiday campaigns and designing creative for your homepage banners, emails, social media, display advertising, and other channels. Optimize your eCommerce site for holiday shoppers by curating your products through campaign landing pages, holiday collections, and lookbooks with holiday gift ideas. An additional way to increase customer orders is by adding “cross-sell” and “upsell” features to your site, recommending relevant products to your shoppers based on their past purchase behavior and recently viewed items. An essential pillar in every holiday marketing mix is pay-per-click (PPC) advertising on Google and other search engines. Be sure to get a head start now by testing and experimenting with small keywords to see what is effective for your brand. Don’t forget to include Google product listing ads (PLAs) in your search marketing mix. Google’s search enhanced product ads, whose CTRs have been higher than text ads since November 2012, will maximize your brand’s exposure on search engines and drive targeted holiday traffic to your site. With mobile commerce expected to reach an unprecedented 16% of retail eCommerce sales this holiday season, it is imperative to plan your mobile strategy well before the holidays. Whether you build an app or mobile site, or decide to make the switch to a responsive website, your mobile experience should engage shoppers and increase conversions through easy navigation and a simplified checkout process. Don’t just assume that your website can handle and convert the spike in traffic caused by holiday shopping. After all the time, effort and funds poured into driving extra traffic to your site, there is nothing worse for your business than a customer getting an error message. Make sure nothing gets in the way of customers completing purchases by working with your IT department to prepare your website for the influx of holiday traffic. Shopping cart abandonment is one of the key concerns of today’s eCommerce executives. According to eMarketer, over 60% of prospective customers abandon online shopping carts after adding one or more items. So how can brands increase their shopping cart conversions? We’ve compiled a list of the top eight ways that brands can optimize their checkout experience to reduce shopping cart abandonment. According to Blair Lyon, Vice President of Marketing at Monetate, the most effective strategy for reducing cart abandonment is to offer a seamless, brief, and simple checkout process. Studies from Forrester have shown that 23% of shoppers abandon carts when asked to create a user account. Give your customers the freedom to forgo registration through a convenient guest checkout option. Most customers want to confirm exactly what they are purchasing before giving up their credit card information. Use a mini cart summary with product thumbnail images to let customers view their shopping cart without leaving the checkout page. According to a study by PayPal and comScore, 46% of shoppers abandon their carts because of high shipping charges. Be sure to disclose all shipping fees to customers by calculating shipping costs based on location in real time. Remove any confusion from online shopping by providing pop-up images to demonstrate how to find the CVV (card verification value) on credit cards. If and when customers experience difficulty during checkout, your representatives should be readily available to avoid losing the sale. Always display your customer service number and email within the checkout form. Put your customers at ease during payment by displaying security badges, certificates, and lock icons next to the credit card field. Even if the cart has been abandoned, it’s never too late to save the sale. Send out triggered emails with a coupon or shopping cart summary reminding prospective customers about their cart items. Do you need to optimize your checkout page for online conversions? Web Cube’s streamlined, one-page Accelerator Checkout supports all eight of the above best practices to take the hassle out of online shopping and reduce shopping cart abandonment. To learn more about how Web Cube’s Accelerator Checkout can save your brand’s online sales, request a demo or call us today at 855.293.2282! Square released “Business in a Box,” a package designed to provide retailers with all the tools necessary for a fully functioning, in-store cash register. The kit includes two Square credit card readers, iPad stand, cash drawer and even receipt printer for an additional $300. PayPal recently partnered with Discover and is now available as a payment option in over 17,000 retailers worldwide, including Home Depot, Abercrombie and Fitch and Jamba Juice. MasterCard launched a cloud called MasterPass, which securely stores card information for users. In addition to storing user information, MasterCard is partnering with VeriFone to enable user-to-purchase using various mobile devices at point of sale. Valentine’s Day has come and gone, leaving online retailers with a fresh understanding of consumer shopping patterns for one of the biggest online shopping seasons of the year. 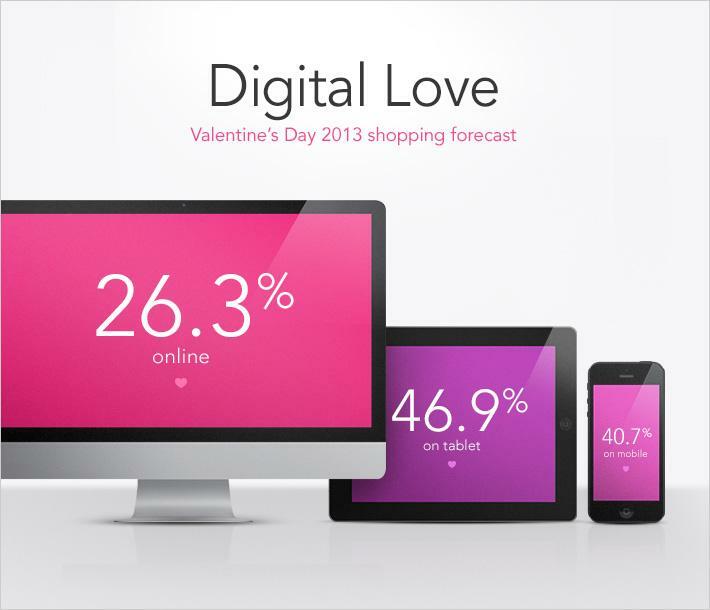 A recent study by BIGInsight projected that 26.3% of Valentine’s Day shoppers planned to find a gift online, up 19.3% from last year. Of those online shoppers, 40.7% planned to use their smartphone to shop for gifts, while 46.9% would use their tablet device to purchase or research gift ideas. Groupon had Valentine's Day graphics on their homepage, highlighting the best deals in dining, jewelry and spas. Flipkart utilized a specialized Valentine’s Day webpage containing “his” and “her” sections with gift suggestions. Krispy Kreme developed QR codes located on the inside of doughnut boxes, which offered a complimentary e-valentine for customers when scanned. 1-800-FLOWERS eliminated credit cards during the checkout process through Expedite, a company that offers “pay later” options. The holiday shopping season is officially upon us, and after a record-breaking Thanksgiving weekend, U.S. online retailers are already seeing green. According to the National Retail Federation, a record 247 million consumers shopped at stores and retail websites over the weekend with total sales reaching a staggering $59.1 billion. 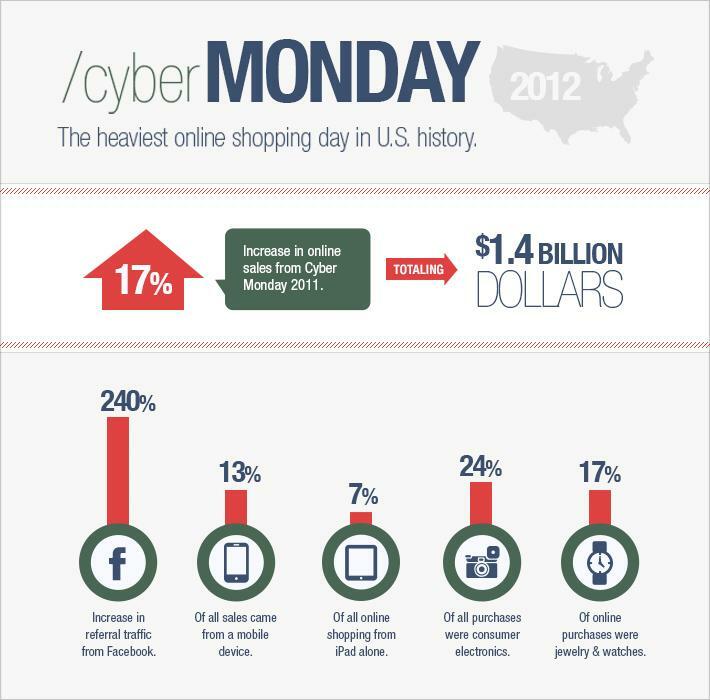 Cyber Monday online sales rose 17% over 2011 to $1.47 billion, once again breaking records as the top online spending day in U.S. history. The average online shopper spent $172.42, a 37.8% increase over 2011, with top items including electronics and accessories, jewelry, watches, and gift cards. 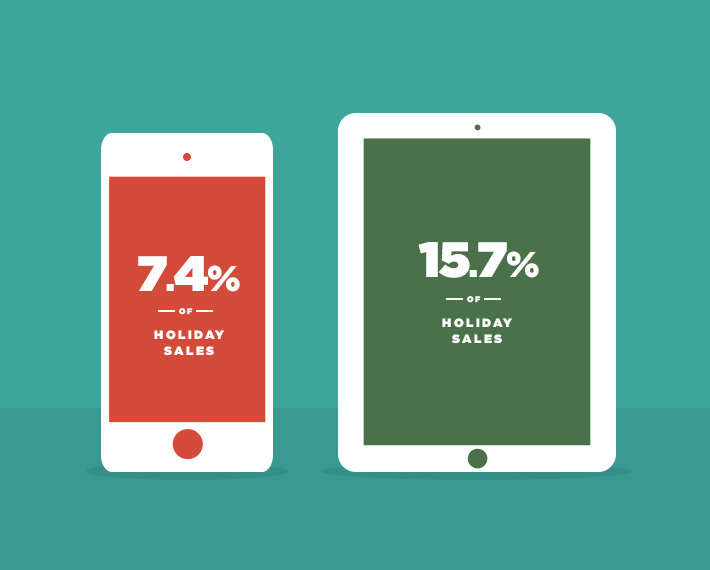 How did mobile and social commerce perform during the Thanksgiving shopping frenzy? While Facebook has reported a 240% increase in referral traffic to top retail sites, third-party reports show that mobile played a much larger role than social in Thanksgiving online sales. Mobile sales accounted for 13% of overall transactions, an impressive 96% increase over 2011, with more than 7% of online shopping attributed to the iPad alone. eMarketer has reported that total 2012 eCommerce holiday sales are forecasted to increase 16.8% to $54.5 billion. After a record-shattering Thanksgiving weekend, U.S online retailers can continue looking forward to a bright holiday season. What does Web Cube have in common with Pinterest and Instagram, the fastest growing trends in social media? They all use Django, the open source web framework with a powerful foundation for building secure, capable, and highly scalable web applications. Django was originally developed by an online-news operation for the purpose of meeting newspaper deadlines. Outside the newspaper industry, the framework has been adopted by high-tech organizations from Google to NASA. With the emergence of several fast growing, world-class Django powered applications such as Pinterest and Instagram, it has proven to be a truly global platform. Pinterest, the highly popular “virtual pinboard,” is one of the fastest growing social media sites with over 10.4 million registered users in less than two years. And that’s just a fraction of Instagram’s fan base, which exploded from 30 million to 40 million users within 10 days of the photo-sharing app’s Android launch, and the much-hyped $1 billion acquisition by Facebook. Although it’s making headlines now, the emergence of Django on the global stage comes as no surprise to us. Web Cube was specifically built on Django because we know how scalable and powerful the platform can be. Instagram and Pinterest are just well known examples of that immense power and reach. We’re also dedicated to empowering Django and the Django community. Our team has released over 15 open source Django libraries and we look to broadening our open source contributions. With Django’s proven success as a scalable platform, we are excited to grow our clients’ eCommerce and web capabilities to a global audience using Web Cube’s Django-powered CMS. Valentine's Day has become one of the biggest non-Christmas season holidays for eCommerce in the U.S., and the love seems to be growing even stronger...this year's percentage rise in Valentine's Day sales should outpace the Christmas year-over-year increase, according to the National Retail Federation. Total spending for the holiday is expected to reach $17.6 billion, and nearly 20% of that will be spent online. How can brands make sure to grab a slice of the Valentine's pie? By offering compelling promotions, offering custom coupon codes, and leveraging social media to make sure that potential gift products are thoroughly promoted. Other powerful merchandizing strategies include building Valentine's-specific landing pages, holiday-themed gift cards, and mobile-ready browsing for the many shoppers who research products on their smartphones or tablets before making purchases. Click here to explore the many ways that Web Cube can customize the online shopping experience for consumers and brands. A Web Cube E-Commerce customer recently launched their Web Cube Mobile Commerce, and found within a month that it accounted for over 15% of their overall E-Commerce transactions. 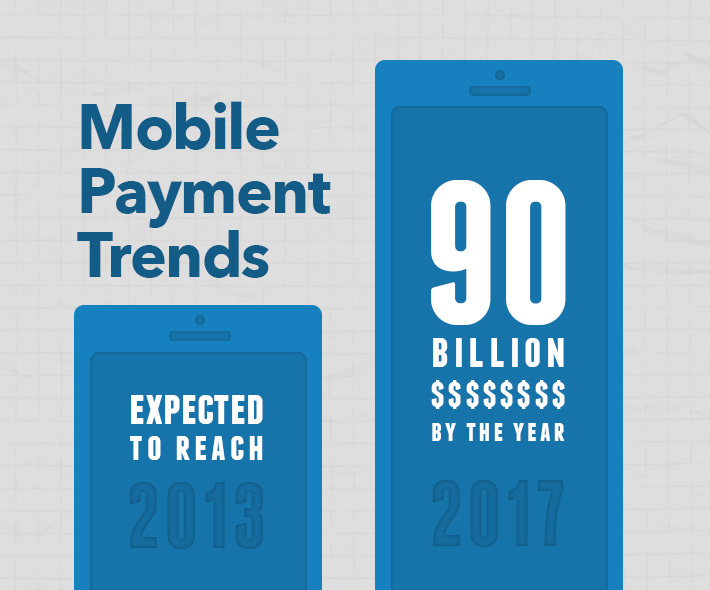 With this kind of growth, it is clear that having Mobile Commerce is no longer an accessory to a great E-Commerce site, it is a necessity. Ian Bicking has just blogged about a new project he is building called toppcloud that will provide an easy deployment container utilizing his virtualenv. We here at Web Cube have deployment scripts using fabric, however we have long admired the simplicity of Google App Engine's deployment, and will watch Toppcloud with interest.